Today was the perfect day to stay at home or “be local”. It snowed for most of the day and for a change I could manage to relax around the house without getting restless or feeling like I was wasting my life. A late breakfast, accompanied by classic FM, some light cleaning (drain, ugghhh) and laundry, and some fun cooking – french beans and tur dal interspersed with staring out of the window. I heard some birds chirping outside and left some bread crumbs outside the door and on my balcony, thinking it must be tough for them to get grub with all the snow. I trudged out to Abney Park cemetery once again today, sliding on the pavements in the gritty slush. It looked even more beautiful today than it did yesterday. The falling snowflakes made everything surreal. The ground was icy but pristine white. I walked in the park’s little paths, feeling like the only person in the whole place. The trees and little plants were completely laden with snow. The occasional bush would heave and its leaves would try and shake off some of their soft burden. I encountered a few more birds, many were singing. Perhaps they too were excited with the beauty of the whole scene. Back home, it was time for the kettle and another cup of tea. I didn’t carry my trusty Nikon today because I didn’t want to expose it to the snow (and sorely missed having a compact camera) but here are some more photos from yesterday. All the branches on these trees were covered in white today, it was magical. The Graveyard Shift – or Sundays at the Cemetery! Would you like to hang out in a cemetery on a cold Sunday afternoon? You would probably say no. However, the Abney Park Cemetery is also a nature reserve. I had a pleasant time trudging about there, clicking pictures of tombstones and graves, some simple, others very elaborate. Some dating back to the early 20th century. The most recent ones being from the ’70s. Time and trees’ roots have made many tilt to one side, some crack, some tombstones and adornments have fallen, many have ivy growing all over them. It was in a way quite sad, the epitaphs of many lovingly written. Many souls missed. But their mourners now having long passed on themselves. It was a sunny day so it wasn’t eerie. There was one time when the sun went behind some clouds and it became quite dark. I was momentarily alone – the other visitors to the park nowhere in sight – surrounded by tombs. I tried my best to work up a feeling of dread, a chill. But I just couldn’t. I have to say though, I wouldn’t want to be here in the dark. After I headed home yesterday from my six-mile bike trip (which my mother assures me is no biggie. Thank you Mommie *drum roll*), I prepared lunch – delectable tomato rice (self promotion galore) – and got ready to go to T’s. For those who don’t know, T is a colleague of mine who’s moved to another country, D, and needs to find a tenant for the apartment he owns here in London. A happy coincidence for me since I need to cut my rental bill and also find a cooler place to stay. Though I love my apartment facing the Thames and the ease of getting to work, I really need to see more people, have a buzzing high street close by complete with vegetable sellers and some restaurants. And some greenery would be nice too, thanks. So Stoke Newington it is. I bought flowers on the way, boarded the overground and headed north. On the bus ride from the train station, I could see how multi-cultural this place is. We passed all sorts of shops on the way including afro-hair and beauty salons. There were people everywhere going about their work, all this activity a far cry from the dull main road my riverside development leads to. A couple of bobbies entered the bus too at a point and looked absolutely fab in their shining uniforms and helmets. Having done my homework like every good potential tenant should, I got off at the correct stop and walked to T’s apartment. I have to say it was love at first sight. I always loved wooden floors. Plus he’s throwing in the TV and speakers. He showed me around the apartment and then made us a cup of tea. Beyond the veranda, I could see a pair of glittering, green eyes in a black furry body staring intently at me. I asked T if he knew the cat and he said he’d never seen it before. I saw two more cats after that, each looking right into the apartment and straight at me in that freakish manner cats have sometimes. Anyway, I took the cats as a good sign. T even sportingly showed me where I could cut out a flap door if I chose to ever have cats of my own in the apartment. We decided to have a walk around the area and walked through Abney Park – a beautiful cemetery maintained as a nature park. As we walked about the tombstones, I entertained images of happy mornings spent exploring the park, taking photographs with my trusty camera. We also walked down Church Street, buying a slice of mediocre mushroom pizza each, taking in the restaurants and little cafes every where. I was happy to note two garden shops and had mental images of thriving plant life in the veranda. I loved the bright paint colours employed by the various establishments – some bright pink, some green, some blue. We came to St Mary’s Church – the church on church street as T called it and went to Clissold Park. More happy future images came to mind and I wanted to spend more time here but T was anxious to show me more of the area. We passed some more graves on the way out, this time it felt creepy and I was glad it wasn’t darker. I don’t think I want to spend any time on this stretch during the dark, winter days. We went to a pub with a beer garden, which basically means they have a section in the back with benches in a garden. In fine weather like what we had yesterday, this is wonderful. 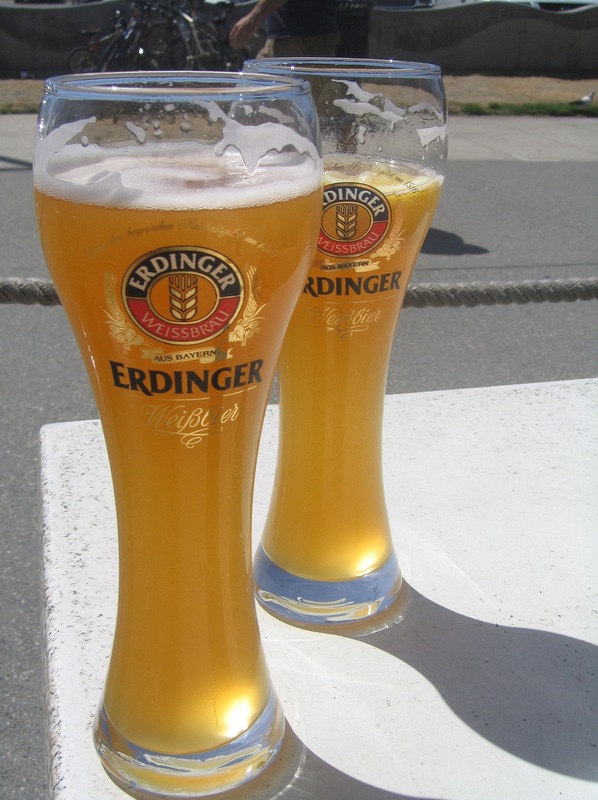 I was happy to find Erdinger – a German wheat beer (Weißbier) from a Bavarian Weißbräu (brewery) – and it brought back happy memories from Berlin. An Australian gentleman joined us at our table and I fabricated a whole load of rubbish to get rid of him, making up stories of how T and I were married, how I am a housewife and how he’s freelancing now that he’s between jobs. I also told him about our little house in Greenwich. T was amused at the pace of my lies and the amount of detail I was putting in. He played along sportingly though. Our unwelcome guest got fed up of the mush after a bit and left. We wrapped up the day at an Indian restaurant – needless to say it was a fairly awful place but I still have some hope that I’ll find a good joint which will quench my desire for aloo parathas every once in a while. This is what apartment hunting should always be like, pity that it isn’t. Anyway, I recognize this as a fairly once in a lifetime opportunity. I do feel slightly sad about leaving my current apartment – my home since the last ten months but such is life and I will have to adapt to a new place.